There are 35 states in this country in which it is better to accept welfare than work at an entry level job. Much like crack cocaine or heroin addicts, much of our nation is hopelessly addicted to living in the welfare state. This has real implications for the emotional and even spiritual health of our nation. The most distressing aspect of the present economic conditions we find ourselves mired in, is the fact that we are allowing our young people to have their dreams and their very sense of hope stolen away from them. Fear monger, naysayer, doomsday profit are terms ascribed to people who dare to criticize the existing economic system and speak about the real implications for our people. I dare the most liberal of you to read the following facts, engage in your own fact checking and then not to be able to conclude that the American dream, for most of our people, is dead and buried. In 1800, 80% of Americans were self-employed. By 1940, the self-employed rate had dropped to18%. By 1967 the percentage of self-employed Americans was only 9%. Today, the number has fallen to 4%. The figures are from Victoria Bonnell and Michael Reich, Workers in the American Economy: Data on the Labor Force. Sadly, according to a 2014 CareerBuilder survey, 20% of full-time workers picked up a second job in 2013! Yet, your average, elitist politician thinks that this is the way that things are supposed to be. Burwell’s commens are representative of todays leaders such Rubio, Jeb Bush and Hillary Clinton. Today the welfare-state plan is forcing what’s left of “the backbone of America” to pay for its own dispossession and disempowerment. And these are not midnight developments. Five years ago, Wayne Emmerich found that the family breadwinner who works only one week a month at minimum wage makes 92% as much as the breadwinner grossing $60,000 a year. Emmerich’s stats demonstrate that by working only one week a month can save a lot of money in child care expense. But topping the list is Medicaid, which is accessible to minimum wage earners and the program has very low deductibles and co-pays. In short, by working only one week a month at a minimum wage job, a minimum wage earner is able to get total medical coverage for next to nothing courtesy of you and me. The middle class is not as lucky as the $60,000 breadwinner pays out approximately $12,000 per year in health insurance costs with an addition $4,500 in co-pays. And if anyone in the part-time minimum wage earning family is disabled, SSI pays out an additional $8,088 per year. When one begins to calculate the expenses incurred by a typical breadwinner making $60,000 per year, compared to the part time minimum wage worker, coupled with minimum wage earners tax supported federal bailouts for these freeloaders, the poor have more discretionary income than those who pay the taxes that run the country. And if the part time minimum wage worker is willing to cheat and participate in the underground economy, they will have significantly more discretionary income than their hard-working $60,000 per year counterpart who actually works for a living. In short, if you are a full-time employee making above minimum wage, you paying for your own economic demise. These economic numbers suggest that we’d be better off staying home and living off of the labors of what’s left of the middle class. There are a 102 million working age Americans who are not working fulltime. In contrast, there are 94 million fulltime working adults in the country. In short, for most industrious Americans, it no longer pays to go to work. This system is catapulting our country towards an economic Armageddon. Welfare pays and pays well, until the government turns off the faucet. Then we will have a revolution inspired by the 146 million Americans who can no longer support themselves. The Social Security Administration released the most accurate economic figures, here, and the statistics do not paint a rosy picture. Just over half of all American workers made less than $30,000 in 2014. Nearly two-thirds of all American workers made less than $40,000 in 2014. Almost 3 of 4 American workers made less than $50,000 in 2014. It takes approximately $50,000 of annual income, for a family of four to squeeze into that increasingly elusive middle class designation. Yet, more than half the country makes less than $50,000 per year. According to a new survey of more than 5,000 adults conducted this month by Google Consumer survey for personal finance website GOBankingRates.com, found the following disturbing facts. Approximately 62% of Americans have less than $1,000 in their savings accounts. Twenty one percent of all Americans don’t even have a savings account! These growing population of have-nots don’t have cash reserves to cover an emergency and will have to rely on credit, friends and family, or even their retirement accounts to cover unexpected expenses. The elite have driven previously high-paying manufacturing jobs out of the U.S. with high corporate taxation and business killing regulations from agencies such as the EPA. The government has encouraged and permitted illegal aliens willing to work for minimum wages while flooding into our country which has driven down wages down and has created an over-supply of cheap labor. ObamaCare has imposed hourly work limits which has subsequently forced hundreds of thousands of employers to limit low-wage workers to a 30-hour week. this has greatly increased the “underemployment” rate which has resulted in the need for record number of Americans to find second income jobs. To hide job loss carnage, government glowingly reports new job creation, but disingenuously refuses to disclose that most of the new jobs are minimum-wage retail jobs. And a large percentage of the new jobs are part-time and/or temporary. Obama falsely proclaims that the unemployment rates is 5.3%. Government accounting is based upon smoke and mirrors. Any profession requiring a credential to do the job, counts someone as being emplyed by merely possessing the credential. This means that all teachers, counselors and beauticians are employed in the government’s eyes. Further, if one goes on unemployment benefits following a job loss. If the benefits run out and the person can’t find a job, that person is presumed to have found work. Subsequently, nobody can trust the government’s figures when it comes to the true unemployment rate. According to economists John Williams (Shadowstats) and Joseph Meyer (Straight Money Analysis), the unemployment plus the underemployment rate in America totals about 25%! We have not even discussed the future impact that robots will have on the American unemployment rate. This is the stuff that revolutions are made of. There has never been a time when the plight of the middle class has been in such jeopardy, the Great Depression notwithstanding. 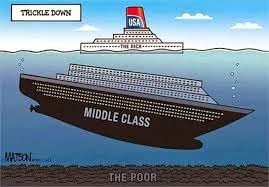 The elite are squeezing what little life remains in the middle class. What are you going to tell your children about their future? How long do we have? I do not know, but with a $19 trillion dollar deficit, a $240 trillion dollar deficit and a $1.5 quadrillion dollar credit swap derivatives debt, the day of reckoning anno be very far away. Gerald Celente likes to remind people that when people have nothing to lose, they will lose it! Most Central American Juvenile Immigrants Are Being Abducted and Trafficked On Their Way to the U.S.
you should do one onid theft..at 1st u got a flyer from state police w special soc sec number to call…automoated then,to call FTC…Then you would,LOL FTC gave you same stupid number..after tht got introduced..then now..make police report..thats a joke now too,then you can have FTC report and number..and there it sits..a soc number was NEVER given at birth(let alone these govt filed birth corporation papers right ay birth even b4 a name given(both things)but a soc number can NEVER be changed..as soon as you fit the requirements..it changes also..who cares if it was over a million..or when its your business or home robbed..doesnt matter if you caught them on security video…you cany even really claim on insurance if police want it that way! !..And I believe ALL are individuals…but it seems their is MUCH more that are corrupt and too many afraid..and too many pretending to sleep now..I found many things out 1st hand in mid2000’s(way TOO many things 1st hand..is legal to profit off others deaths or homes being burnt down..to hold insurance as police hands are tied..even if u get or find the policies!! and to find..no existing cross ref of who holds ins on homes or lives by address) ..is when they were starting to really enforce laws that no one still gets are REALLY in place!! !May our Creator be with! !